Helen Russell is a Research Professor at the Economic and Social Research Institute. 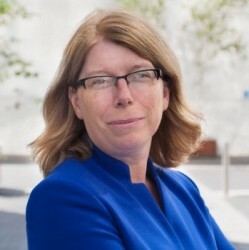 She is the deputy head of the Social Research Division and coordinator for research on the Quality of Life and re-joined the Study Team Management Group for the Growing Up in Ireland project in 2018. She holds a D.Phil. in Sociology from the University of Oxford. Before joining the ESRI in 1998 she was a Prize Research Fellow at Nuffield College, University of Oxford. Her research covers a range of inter-connecting issues relating to employment, equality and social inclusion. The intersection between work and family life is also a theme addressed in Helen’s research using the Growing Up in Ireland survey. Recent studies have examined the patterns of childcare and the effects of different forms of care on children’s cognitive and socio-emotional outcomes.